I wonder if their numbers are being bolstered by refugees from the dwindling Scottish colonies in search of sandeels. Scientists are fitting puffins with hi-tech tracking tags to try and understand why the number of puffins on the Farne Islands, one of the most important colonies in Britain, has mysteriously dropped by some 30%. Puffin numbers are down from 55,674 in 2003 to 36,500. 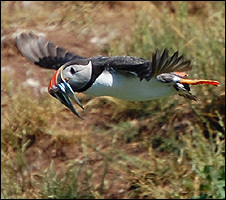 The Farne Islands are home to the largest puffin colony in England. Seabird numbers in Scotland fell by 19% between 2000 and 2008, according to a new report. Scottish Natural Heritage (SNH) said the major cause was almost certainly a shortage of food due to a drop in the number of small fish, such as sandeels. If the declines continue, many of Scotland’s famous “seabird cities” could be virtually empty within ten years. 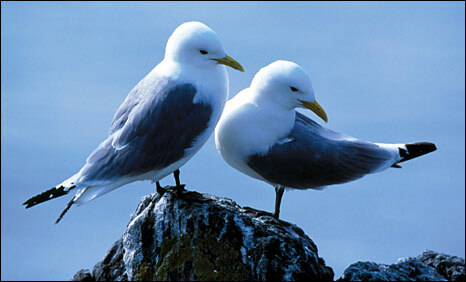 Kittiwake numbers have fallen by 40 per cent since 2000 and the shag population that has dropped by 25 per cent. The Arctic skua population has dropped by 57 per cent and the herring gull population has dropped by one third. Shearwaters are associated in folklore with death. This undoubtedly comes from their eeirie cooing nocturnal cry like a cackling witch from the underworld. Richard Dawkins cites the Manx Shearwater on page 87 of his book The God Delusion. One of the cleverer and more mature of my undergraduate contemporaries, who was deeply religious, went camping in the Scottish isles. In the middle of the night he and his girlfriend were woken in their tent by the voice of the devil, Satan himself; there could be no possible doubt: the voice was in every sense diabolical. My friend would never forget this horrifying experience, and it was one of the factors that later drove him to be ordained. My youthful self was impressed by this story, and recounted it to a gathering of zoologists relaxing in the Rose and Crown Inn, Oxford. Two of them happened to be experienced ornithologists, and they roared with laughter. ‘Manx Shearwater!’ they shouted in delighted chorus. One of them added that the diabolical shrieks and cackles of this species have earned it, in various parts of the world and various languages, the local nickname ‘Devil Bird’.